The TouchWiz gallery orders photos by time, but you can switch to folder-based Album view. Sharing options include wireless printing, Android Beam and Wi-Fi Direct, but no DLNA (or other way to send an image to your TV). The Galaxy J5 (2016) features just the Google Play Music app. It gets the job done by allowing you to sync your music across devices and gives you some control over sound via an Equalizer. The player itself has a straightforward UI with most functions available as shortcuts on the Now Playing screen. The Galaxy J5 (2016) also has an FM radio built in (something many Galaxy flagships do not). It can record radio broadcasts (though this may be disabled in some regions). There's no RDS though so the app won't show the name of the station. The video player is the only app that works in pop-up window, a feature dating back to the Galaxy S III. You also get full subtitle support with advanced features to modify their appearance. The app lets you play only the audio (if you just want to listen to a music video) and to play the audio via Bluetooth (if you have a BT-enabled speaker handy). There's an "Editor" option too though that may be overstating it - it just lets you trim the video. Again, there's no DLNA or another wireless method of sending the video to a bigger screen. No wired ways to do it either. The Samsung Galaxy J5 (2016) went off to a great start in our audio test. When used with an active external amplifier its scores were as high as you’d expect and loudness was easily above average for an impressive performance for a mid-ranger. 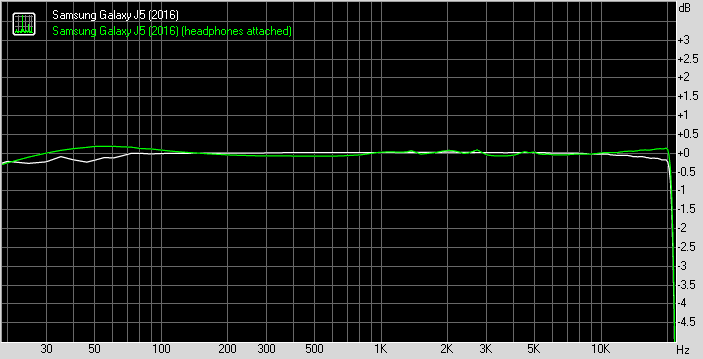 Plugging in our standard headphones led to worsening of the stereo quality and added some intermodulation distortion. Volume levels remained high though and the other readings remained unchanged so the overall results were much better than we expected.